Osmanthus is one of the 10 famous flowers in China and Taiwan and the flower of the month of August. A traditional symbol of Love and Romance. 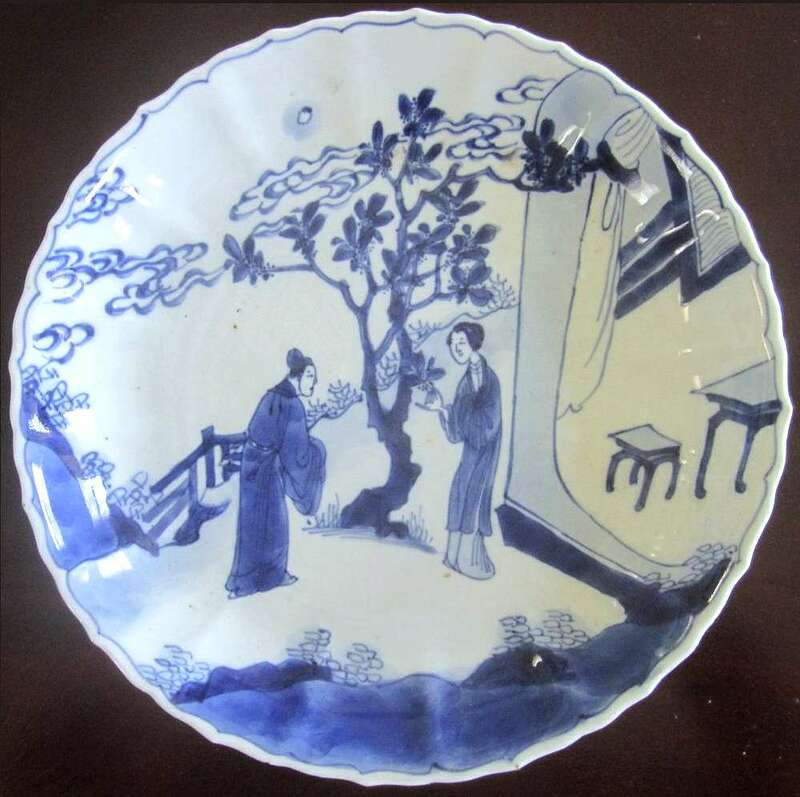 Dish underglaze blue and white decoration, Kangxi period 1662-1722, ca 1690-1700. Photo curtesy of: Henri René CADERIUS VAN VEEN, Gotheborg Discussion Board. Osmanthus is one of the 10 famous flowers in China and Taiwan and the flower of the month of August. A traditional symbol of Love and Romance, Osmanthus was used in old wedding customs when the bride prepared Sweet Osmanthus and Pomegranate pot plants and carried them to her new family. 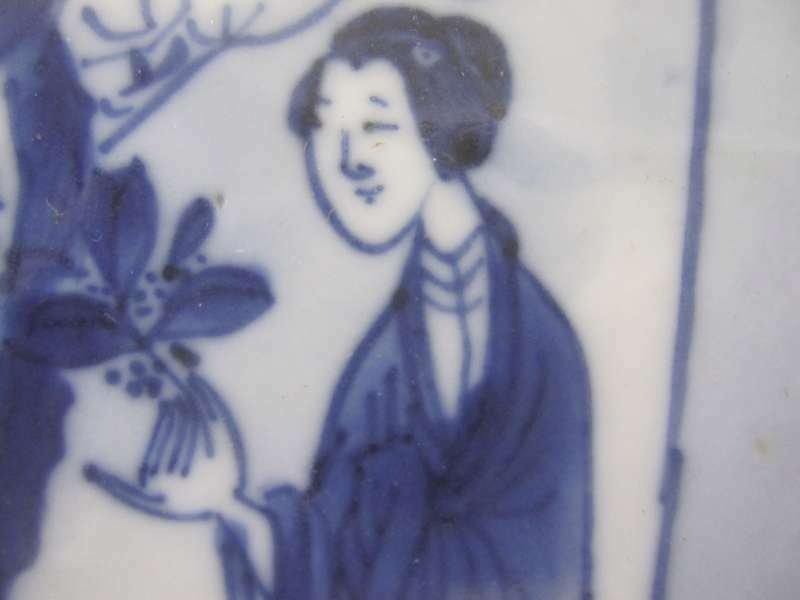 The fragrant plant symbolized True Love and Faithfulness and the fruit tree - Fertility and Peace, and the custom had the meaning of "giving birth to noble children" and "many children and many grandchildren". Osmanthus fragrans flowers are also known as gui hua. These tiny dried yellow blossoms are among China’s most heady and intoxicating flower blossom fragrances. China’s great flower-scented teas were developed during the Ming dynasty (1368-1644). Osmanthus, jasmine, rose, orchid, lotus, gardenia and wintersweet were all used to delicately scent batches of tea. The Osmanthus is a slow growing medium size shrub or smaller tree that can easily be kept in container as a compact plant for years. It has grown in China for thousands of years. There is a famous city called Guilin which means "fragrant forest", referring to the large number of fragrant Osmanthus trees located in the city. Its scenery is reputed by many Chinese to be the "finest under heaven". The sweet-scented Osmanthus is the city flower of Hangzhou. Chinese monks planted these trees around Buddhist temples in the Manjuelong Valley which lies in the mountainous area. As time went on, the blossoming Osmanthus trees in the valley became an autumnal allure to Hangzhou residents. The valley is flanked by hills where springs are abundant and trees flourish naturally. The geographic advantages and monk's heritage has made the valley a paradise of osmanthus trees. Now all households in the valley without exception have their own osmanthus groves. Osmanthus trees can be seen everywhere in the valley. When dew is heavy at dawn, flowers will fall floating like a rain in a breeze. Osmanthus fragrans is associated with a number of Lunar legends in China, which makes it symbolic at the time of the Chinese Moon Festival which is held in September under the symbol of Osmanthus Flower and is also called Osmanthus Festival. In the warmer parts of China, the plant continues to bloom non-stop throughout the winter to spring. During the nights of the peak season for the flower, Chinese families used to gather in their yards to eat moon cakes, while the grandmother of the family told traditional stories about the Moon, the sweet Osmanthus and the figures of Chinese legends. According to those legends, there live on the Moon the Fairy Chang E and a Jade Rabbit which is Chang E's pet, a Giant named Wu Gang and a huge Osmanthus Tree (Osmonth). In ancient times the Jade Emperor held ceremonies to offer sacrifices to the sun in spring and to the moon in autumn. During a midautumn evening a magic Taoist priest named Luo invited him to visit the Moon Palace. Luo threw his stick into the air, and immediately a silver bridge from the heavens stretched before them. Across the bridge, there was a magnificent palace. A plaque above the gate read "Guanghangong (Vast and Cold Palace)". By the gate stood a tall, sweet-scented Osmanthus tree and a Jade Rabbit set under the tree mixing a medicine for eternal life. Hundreds of beautifully dressed dancers surrounded them accompanied by melodious music and entertaining the Emperor with delicious cakes shaped like the full moon. Upon returning to the earth, the Emperor ordered cakes modeled after his vision. The Legend of Wu Gang and Osmonth. Driven mad by jealousy the giant Wu Gang had made a serious mistake and was sentenced to the Moon by the Jade Emperor, to the Palace Guanghangong, to chop down the huge immortal Sweet Osmanthus tree growing in the front of the Palace. Cutting down the 1500 ft tall tree turned out into a painful and endless task since the tree had magical power and once cut it immediately recovered. The endless chopping and recovering goes on for thousands of years since under this three was the Rabbit, who pounded the elixir of immortality with a pestle and mortar, that helps the tree recovering. The Legend of the Moon Lady. Once upon a time the Jade Emperor rewarded the master archer Hou Yi with the elixir of immortality - a sweetly perfumed magic pill. His wife, beautiful Chang E decided to abandon her husband and stole the pill from him while he was asleep, and thus gained the ability to fly. She flew all the way to the Moon. This led to her being exile in a chilly Moon Palace, where she was condemned to live a life in solitude. Until this day you can see Chang E roaming the Moon alone. A beautiful fragrant Osmanthus tree in front of the Palace reminds her about her lost love, keeping Chang E in deep regret and sorrow. The Jade Rabbit that already lived on the Moon became her pet, and Chang E commanded the animal to take pestle and mortar and pound a magic pill so that she returns to Earth back to her husband. Since the rabbit is kept busy with producing the elixir of immortality for the Osmanthus tree, he has no time to help her with that. Osmanthus, (from Greek osma, meaning "fragrant", and anthos, meaning "flower".) was introduced to Europe in the middle of 19th century by the French botanist Jean Marie Delavay.